DJ Kawasaki is a somewhat a newcomer, a rookie if you will. However shortly after he released his debut album "Beautiful" in fall of 2006, he became a staple and a new ambassador for Japanese club and dance music. He usually makes his own original compositions in music in addition to remixing other people’s songs. The reason why I call him Mr. MPC 3000 is that he is known for using an Akai MPC 3000 drum machine for making his fabulous beats. In my opinion he has unique house/dance music scene by successfully mixing house with soulful music into his tunes. According to his official Facebook Page, he listed his genre as HOUSE/CROSSOVER. Wow, such a genius term. Nevertheless, his music ingredients not only limited to House, he countably added musical instrument such as Trumpet as his typical tune. In addition, he often featuring with surprising act like Lena Fujii, Tasita D'Amour, Lori Fine, COMA-CHI, etc and gives fresh sound than any other typical House/Dance music DJ. Actually, one of my favorite song from him is [Paradise] feat. COMA-CHI, but due to restricted distribution from EMI Music Japan, unfortunately I can't upload/show you here. For more information about DJ Kawasaki, you could check in Official Website(in Japanese). 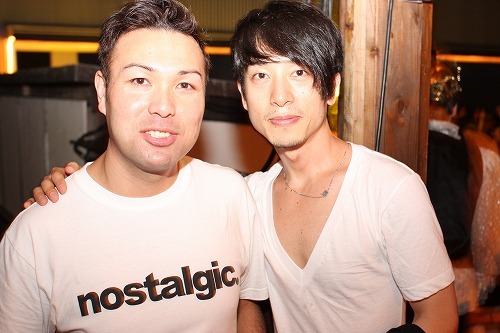 Daishi Dance (ダイシ・ダンス) is a male Japanese DJ born in 1976. Daishi Dance performs in the heart of Sapporo, creating melodious house mixes that feature vocals conveying grief and discontent, and using three turn tables in a hybrid DJ style. Daishi Dance has performed at many events with artists such as Studio Apartment and FreeTEMPO. He has performed at CLUB YELLOW, in Roppongi, as well as with Morita Masananori of Studio Apartment, as the duet “MUSeUM", which performs at many regular events in the club. Since March, 2008, Daishi Dance has performed at the club ageHa, in Shinkiba, Tokyo- at the regular party called “POOL HOUSE”, and certain other events. On July 2, 2008, Daishi Dance released "The Ghibli Set", which contained 12 licensed remixes songs featured in movies created by Studio Ghibli. This album hit number 12 on the Oricon charts, and remained at this position for 3 weeks. I do agree with Wikipedia, since most of his songs often sound sad or should I call it melodic-dance house music? Comparing to DJ Kawasaki, DD mainly perform live in Northern part of Japan precisely in Sapporo area. He is also mainly active user of Youtube, or any other social media activity not forget to mention his 'active' Discography since 2006. His typical music mix house with classical instrument especially Piano; could be listening at his released album compilation entitled "The P.I.A.N.O. set"
Waddya think? Obviously they are the only two DJs I wanted to see live: fresh from Japan. Even though you are not House/Dance music scene party animal, at least you should (once) try listening to them in order to enrich your variety of music genre. Isn't it right, dear reader?